In January, 2018, Akron City Council unanimously adopted the resolution declaring the first Monday in October a day to honor Indian history, life and culture, after 7th and 8th grade students from The Lippman School along with representatives of the Northern Cheyenne Nation in Montana and the Seneca Nation in New York State made presentations to the Council. Shaw Jewish Community Center, 750 White Pond Drive. Free Admission. Thursday, Sept. 27, 7:30pm, Auditorium, Shaw JCC, 750 White Pond Drive.Free admission. Artist’s Talk, Peter Jones. Free admission. Trolleys will shuttle guests from parking lots at San Run Metro Park’s Big Bend area, 1337 Merriman Rd., and Treaty Line, 975 Treaty Line Rd to the site. 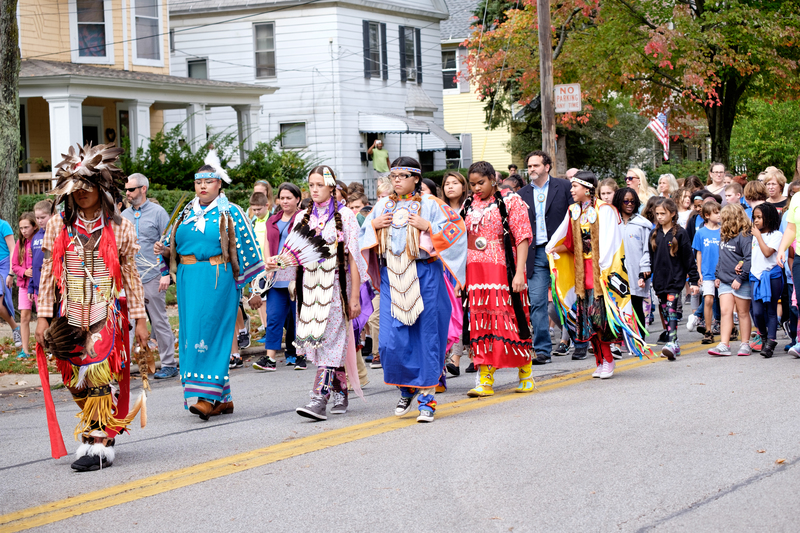 On Monday, October 1, North American First People Day will be recognized with the third annual walk of the Path, and will involve over 200 students from The Lippman School, the Akron Public Schools’ Portage Path CLC, young people from the Northern Cheyenne Nation, Emmanuel Christian Academy, and other schools who will join the walk, which is open to the public. The walk will begin at 1:00 p.m. at Portage Path CLC, 55 S. Portage Path and will be led by members of the Northern Cheyenne Nation of Montana, who will be drumming and dressed in regalia. The walk crosses West Exchange Street and will end at the Perkins Stone Mansion, 550 Copley Road. There will be a short program that will include drumming and singing. There is no admission charge and the public is welcome to attend. The symbolic walk will allow students to learn more about the native people who used the portage, which was marked by the Summit County Historical Society in 1999, when for the first time, monumental sculptures at each terminus of the Path were connected over the 8-mile trail by fifty markers in the shape of historic Indian broad blades. Originally created by indigenous people who populated the area for millennia before the first Europeans arrived, the Portage Path today exists as one of the oldest, most visible landmarks on the North American continent – crossing the watershed divide between the Cuyahoga River and Tuscarawas River. Students from Lippman, Portage Path CLC and the Cheyenne Nation joined together in 2016 to create a web-based mobile “app” that provides extensive information about the Indian trail, including its history and the natural world that it traverses. The app can be accessed at www.walkportagepath.org. The activities are sponsored by a new coalition, The Portage Path Collaborative, an assembly of educators, organizations and individuals committed to preserving and sharing the history of the First People of Akron and Summit County. The group includes: The Summit County Historical Society, The Lippman School, Summit Metro Parks, Akron Portage and Paddle, Stewards for Historical Preservation, LaDonna Blue Eye (Choctaw) and The University of Akron Institute for Human Science and Culture/ Cummings Center for the History of Psychology. A new publication outlining the historic trail and the history of Native peoples who used the Portage Path has been published, and is free and available at the Historical Society and at Metro Parks’ Seiberling Naturerealm. Contact Matt Russ, The Lippman School, mruss@thelippmanschool.org, 330-836-0419.